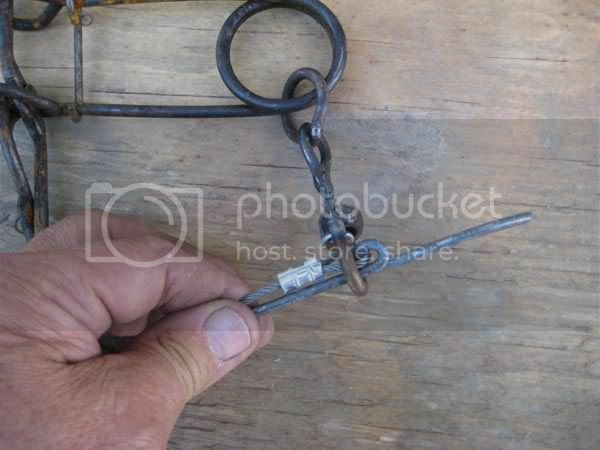 Over the years I have developed this after using many clips, chain links, etc. 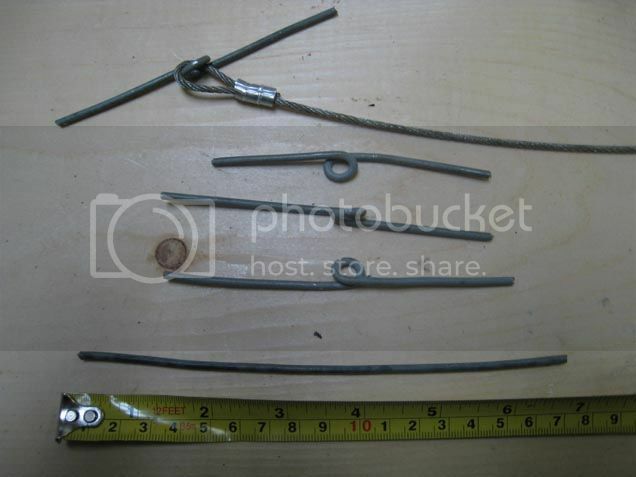 etc These are easily made up and no pliers, haywire, or wrenches to carry to place your traps or take them down. Fast to replace traps with a frozen critter in them. I call it a "quick link". Use them to fasten all your conibear (rotating jaw) traps for marten to beaver and otter sets. 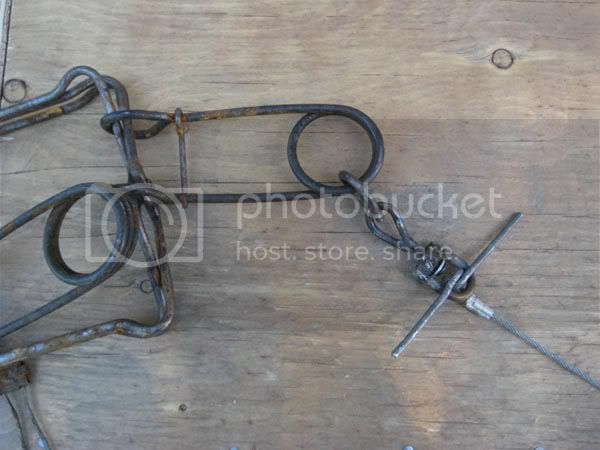 Every conibear trap I own is equipped with the swivels now. 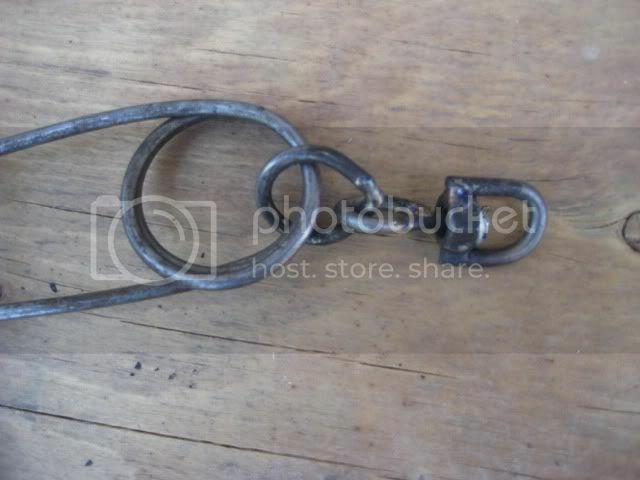 We used a similar chain device in the stalls of our dairy when I was a kid to tie the milk cows in the stalls. So it is not new science by any means. 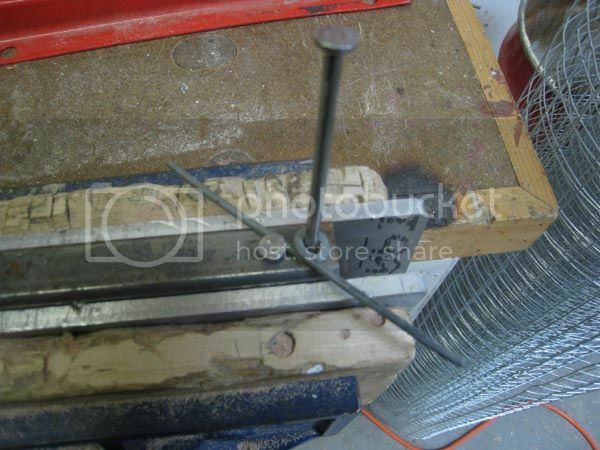 Here is how you make the wire link. 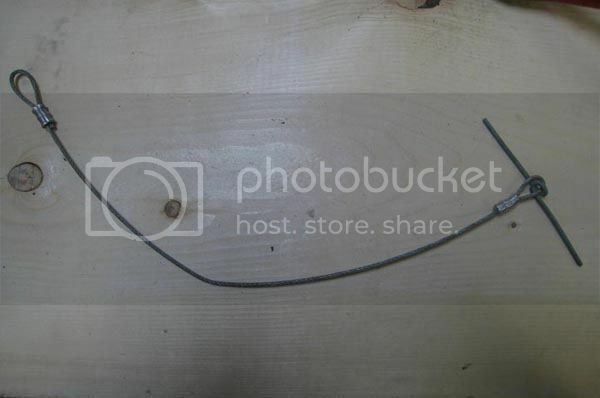 Use #11 galvanized wire and you could pull a truck with it. This is the jig. 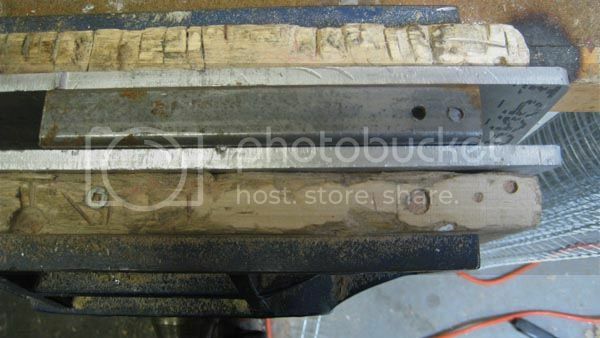 Simply a piece of tube steel in a vice with two holes drilled in it and two nails. Twisting the wire which is held with one nail and wrapped around the other. After removing you may have to flatten it with a hammer or hammer the top of the loop a bit so it goes through the swivel eye. here is a closer look at the finished links to see what they look like. I find that a 6 3/4 inch long piece of wire is adequate and if you get one side longer than the other you can trim if your fussy like me. So with 3/32 7x7 cable and a couple of ferrules make up your cables with the quick link. Make various lengths. 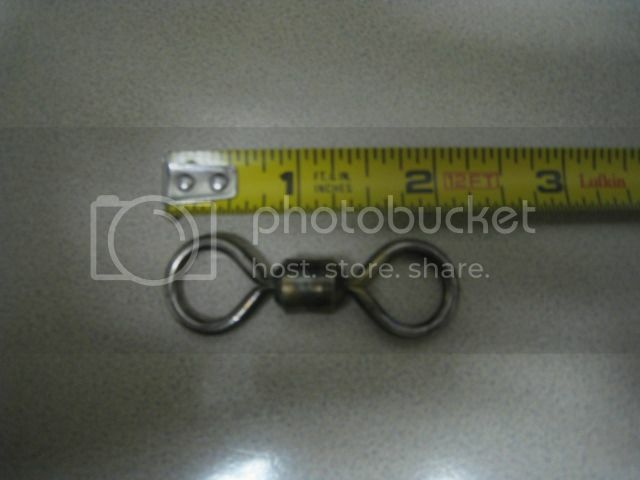 Next there are several swivel examples to attach to a trap. This is the first I used with homemade swivels. 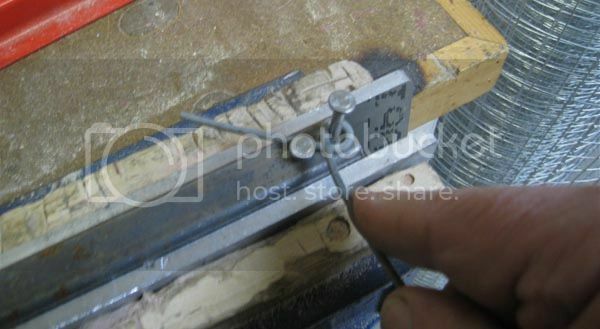 Takes a while to make the swivels and you need to be a bit handy with a welder. So not going into much detail on it. Under Halibut and Cod-Longlining on the search bar. There are three stores, suggest the one in Richmond. 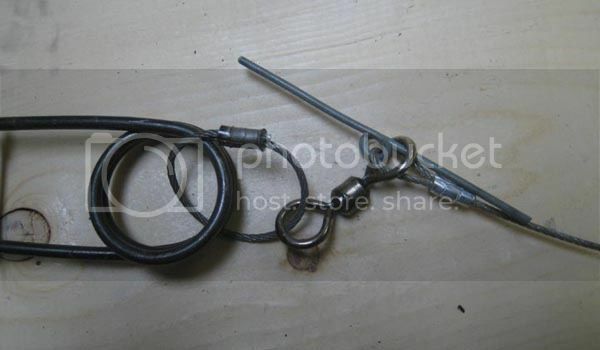 These are attached to the trap spring with a small loop of 3/32 7x7 wire and a ferrule. The large halibut swivels are not easy to come by so next I started using smaller barrel swivels and two loops of 3/32 7x7 wire. These are 900 pound barrel swivels available from Wayne & Marlene at the NAFA depot in Prince George. It can be used on Marten sets both horizontal and vertical. On the horizontal sets I pass the cable under the box and then pass the quick link through the loop end fastening it solid. On vertical sets I like to put a pole above the trap and fasten the cable in the same manner. Don has suggested using a 4x4 with a brace to fasten it to. Tomcat uses a staple. 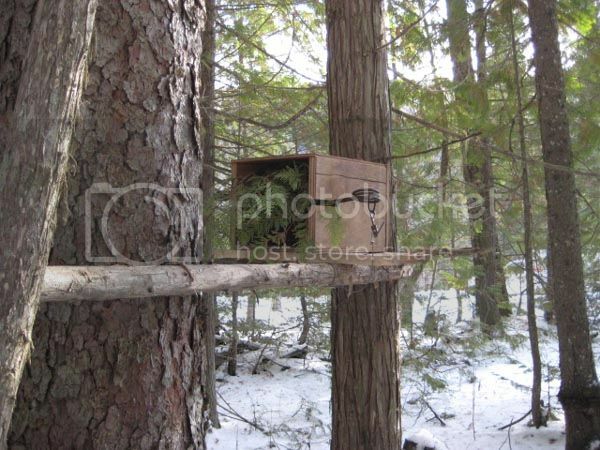 My boxes and quick link cables stay out in the bush, just the trap comes home with me. We use those on all our cat sets. Very easy to wrap the cable around the tree, through a loop at the other end, and then attach to the trap with the nail end through swivel. Use 1/8th cable. Love that system. May have to give this a shot, thanks for sharing! 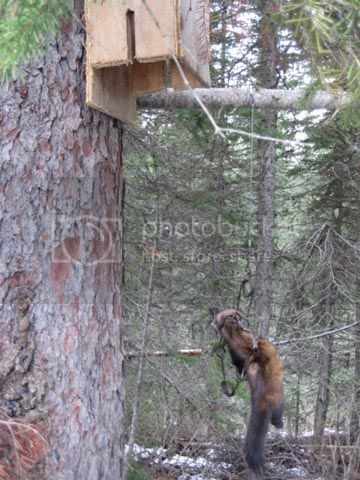 Thanks Ron am gonna have to do this to some of my marten traps, get sick of fooling with wire on them,wonder if a guy could make them adjustable? Where I have had one that was too long I wrapped it twice around the tie pole or made knot in the cable to shorten it a bit. Have mot found a way to make one longer but thought of some really short ones with just two loops to add on. They also work well on RR plates for water set drowner anchors. KB Manufacturing makes these as well. 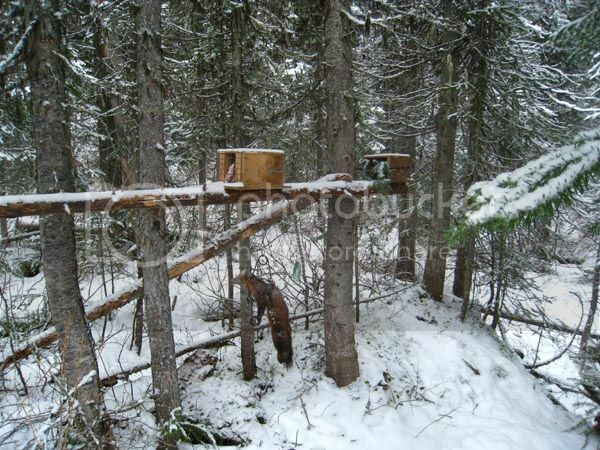 I have a few dozen coyote traps rigged up to see if I liked the idea. Normally my traps are anchored to cable stakes driven in the ground. Many are left till the next year, so Usually I had to open the jay hooks to separate the trap from the cable. Or to change a trap after a catch. The rods no doubt will be on all my traps for coyote and marten/fisher in the future. I'd noticed the use of the swivel in your wolf snare post. Always wanted to try some on coyote snares but was worried about them not holding up. Guess I had no worries! Nice Information as usual Ron, Thanks! Last edited by Hornhunter; 01/16/13 08:25 AM. 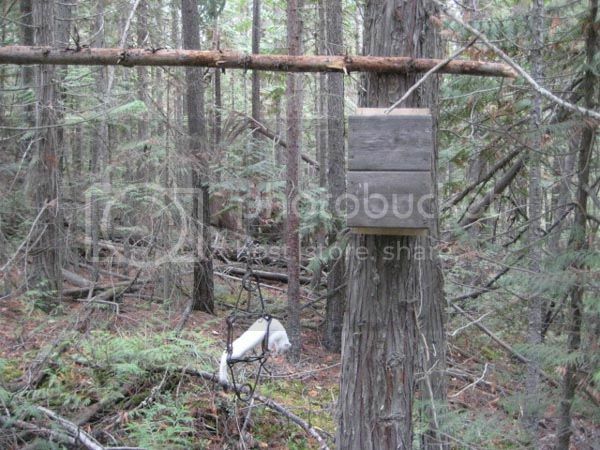 You would try these on your coyote traps Al? I don't know if I would want them on footholds because of damage to the animal and fur. We have added cable to all our large conibears in a similar way but the cable is fastened solidly to trap and a heavy duty snap link is on the end. The cable is wrapped around the nearest anchor and snapped back onto itself. 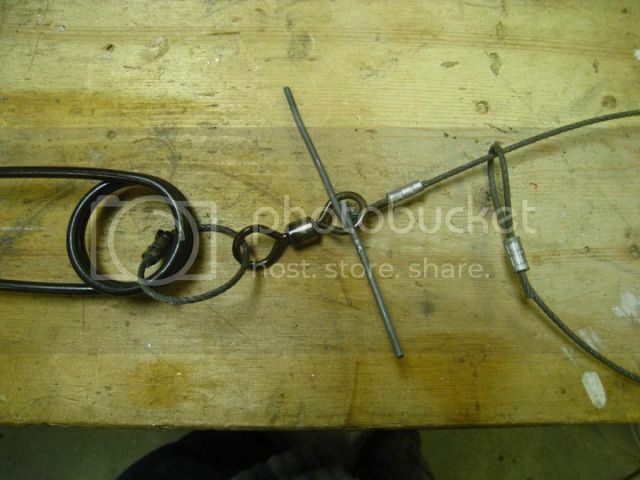 We purchased the rings that go around a spring eye to attach the swivel to and then added the cable. 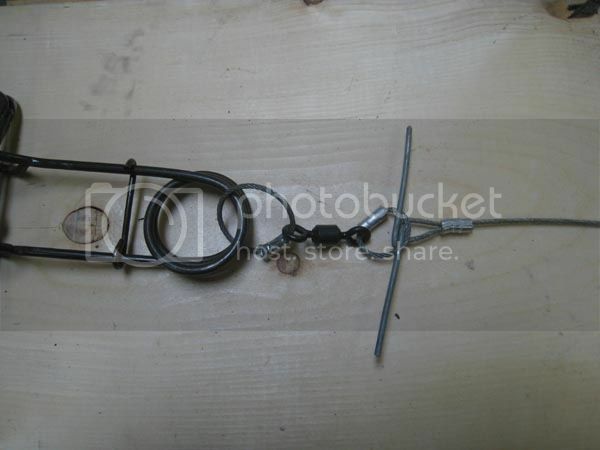 My trapping partner hates wire and we are slowly converting most traps to cable. John, Can't see why you'd think that hook up would do fur damage. When they're hooked to the cable stake they are usually ground level or below. Even if you added them to a chain and drag, and i have done a few, i see no way any fur damage could be done. I had some conibears last year that trapper allowed me to use with these on them. However they were at the end of the cable and I found them to be very annoying with cable attached. 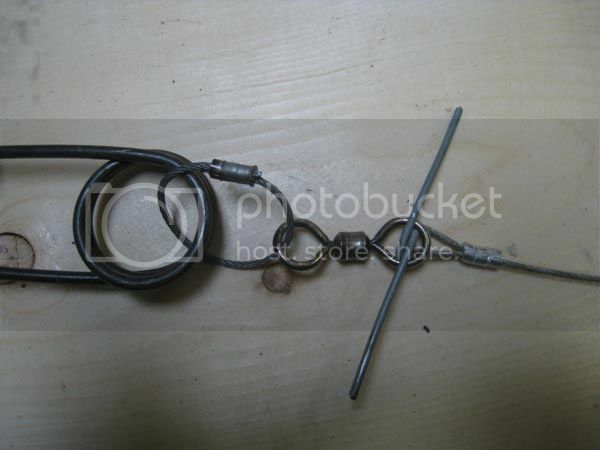 I hate messing with wire or cable of any kind on a trap when transporting or storing. I really like this idea of attachment. 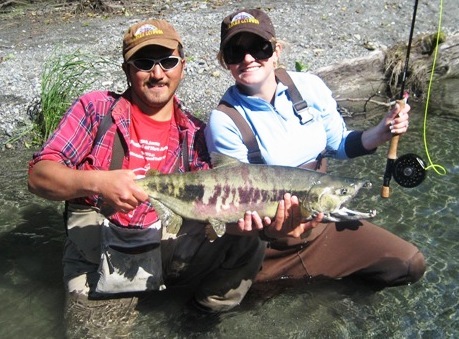 Couples a quick link with out having the cable to deal with on the trap when you pick it up. Thanks for sharing that I ideas. Zip ties Len. 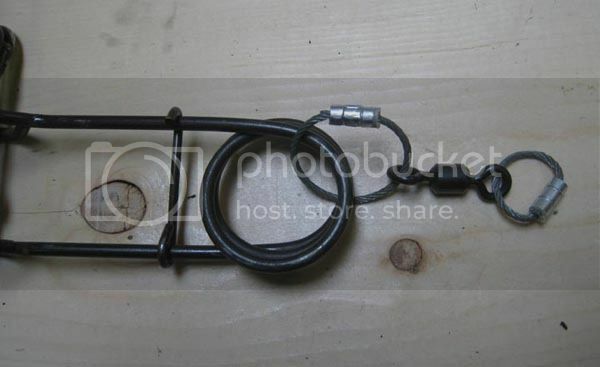 Every trap we have has been zip tied before it goes into a tote. Bumping this to the top for Frozen Okie. Ken could you archive this tutorial please ?